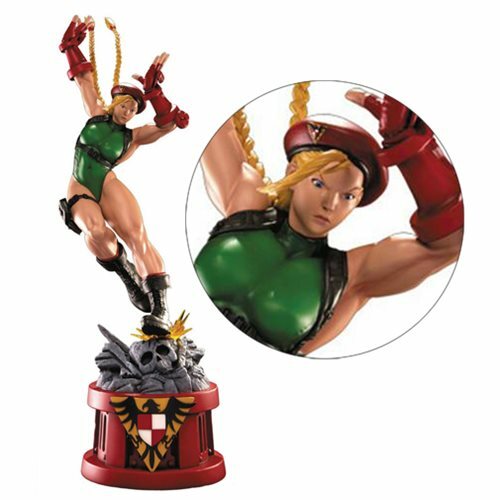 Shopping for Street Fighter Statues? Cammy lands an aerial Cannon Strike attack! The femme fatale from Street Fighter stands 28-inches tall! Straight from Capcom's 3D models. Limited edition of just 600 pieces. This Street Fighter V Cammy 1:4 Scale Statue features Cammy symbolically landing an aerial Cannon Strike attack on a stone Shadaloo symbol. Straight from the 3D models from Capcom, she's crafted with the utmost detail. Sculpted by Jon Reilly, Justin McMillan, and Hector Arce, and painted by Mike Najera, Cammy is a limited edition of just 600 pieces! The 28-inch tall statue comes with a signed certificate of authenticity.